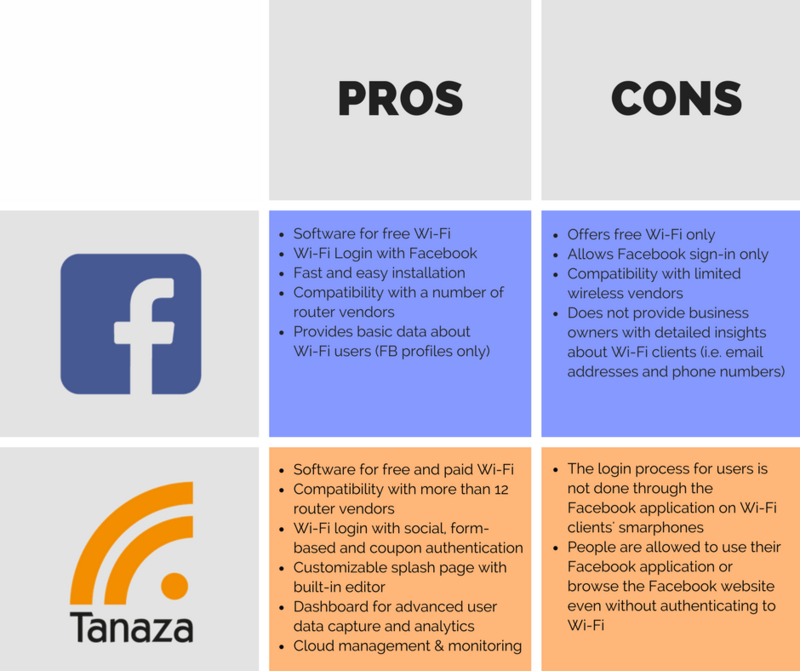 Facebook Wi-Fi, like Tanaza, is a software that enables businesses to offer free internet to their customers. It enables guests to connect to a guest network using their Facebook credentials on any of their personal devices. To have access to Facebook Wi-Fi, the requirements are an access point compatible with Facebook Wi-Fi and a Facebook Business Page, of which you are an administrator of. This software is installed and configured directly on the Wi-Fi router settings and can be personalized further on the Facebook Wi-Fi configuration settings page. On this page, you can configure the Facebook Wi-Fi settings directly, including the terms of service, session length, bypass mode, etc. So, what similarities between Tanaza and Facebook Wi-Fi? Despite Facebook Wi-Fi’s similarities with Tanaza, each software has distinct functionalities that tailor very different business needs. What sets Facebook Wi-Fi apart? Tanaza enables you to create a personalized, responsive splash page with the splash page editor before allowing wifi users to connect. See Tanaza’s full list of features here. Determining what software is the ideal fit for a specific business can be very tricky. The real key to choosing the right software is to take into account whether that the business’ goal is to offer a free Wi-Fi connection with a simple social login and no data capture, or to run real-time direct marketing and indirect campaigns with the user data collected from the Wi-Fi users.